"When you lose someone you love, it doesn't end with that event, or their funeral, or with their name on a tombstone. You lose them again and again, every day, in the small moments that catch you off guard." 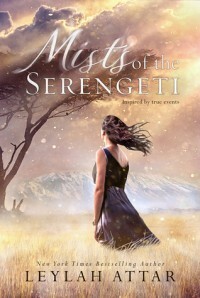 While Mists of the Serengeti is not without its small hiccups, it could get a little cheesy at points, I still loved the story it imparted. Such a heartbreaking story, and not just the tragedy that started the story, whereas, they both lost someone they loved in a terrorist attack. There is so much more to the story than that. The lush African Setting is fascinating. The plight of the albino children is poignantly heartbreaking and ultimately uplifting. The romance is irresistibly sweet, and that epilogue...wow...that was something else. Book Cover~ A wonderfully beautiful cover.